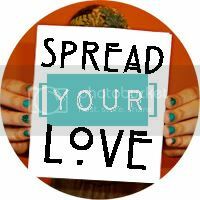 This evening I linked up with a fabulous new feature this week called Spread Your Love. Right when I saw the title I was hooked, of course! Some lovely women put this together to help us see our true beauty. This is the week of sharing with all what you love about yourself. ♥ So swing on over and then take a picture of what you love then spread the word. Green is my favorite colour. There are 3 freckles in my left eye. I love that I'm Irish.